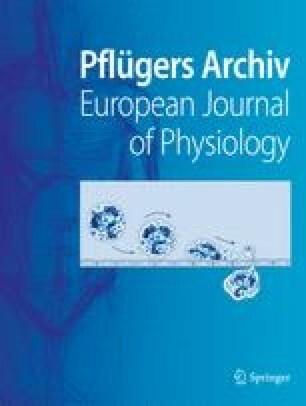 The effect of caffeine on inward current carried by barium ions through voltage-dependent calcium channels has been investigated in single rabbit ear artery cells using whole-cell voltage-clamp techniques. Caffeine (1 –30 mM) caused a rapid and reversible concentration-dependent blockade of barium current and a related compound, 3-isobutyl-1-methylxanthine (IBMX), was a more potent inhibitor of barium current. Caffeine-induced inhibition of barium current showed no voltage- or usedependence and caffeine did not alter the steady-state inactivation of barium current. The effect of caffeine was not blocked by extracellular or by intracellular ryanodine or inclusion of both 5 mM 1,2-bis(2-aminophenoxy)-ethane N,N,N′,N′,-tetraacetic acid (BAPTA) and 2 mM ethylene glycol-bis(β-amino ethyl ether) N,N,N′,N′,-tetraacetic acid (EGTA) in the intracellular solution. Rolipram and M&B 22984, non-xanthine inhibitors of phosphodiesterase, did not diminish inward barium current. The data indicate that caffeine and IBMX block voltage-operated calcium channels and it is suggested that this is due to a direct interaction of methylxanthines with the calcium channel.